“My jewels are, above all, a form of artistic expression”. Jaime Moreno makes high quality, contemporary and timeless creative jewelry. Innovative jewelry made with precious metals, selected gems and exceptional stones, in some cases unique ones. At a time when the paradigm of luxury is being redefined, the artist bets on original designs, full of color and life that can be used by a woman to express the most beautiful personality and individuality. The new concept of luxury is not based on the mere possession of objects, but on the search for much deeper meanings and genuine experiences. Thus, the luxury of his jewels is not based on opulence or ostentation, but on sublime differentiation. It is based on authenticity, on beauty to fill the life of art, on the pleasure of carrying a work of art as a decoration. It is about being, not about pretending. The real luxury is exclusivity. His clients are people who want to differentiate themselves, love design and seek exclusivity, regardless of social trends and dominant tastes. The works of Jaime Moreno are inspired by nature, which he considers to be the reference source of the concept of beauty. His jewels offer beautiful gems and precious stones to enjoy them and to accompany us in our daily life. His designs are clearly influenced by his passion for Art Deco and Art Nouveau from the beginning of last century and are enhanced by the color and strength of the stones he uses. Some of his creations are unique and absolutely unrepeatable pieces and others are part of very limited series. In a sort of Renaissance movement, Jaime Moreno is part of a select group of designers who wish to use jewelry to expose and arouse feelings. They aspire to create jewels capable of emotion and susceptible, therefore, to be considered true works of art. Over the last years, there’s been an increasing interest in buying Jaime Moreno’s jewels by art and jewelry collectors as well as renowned art galleries from many different countries. All of the above reaches its true meaning when the passionate about art, the collector, makes his own one of the pieces created by Jaime Moreno. 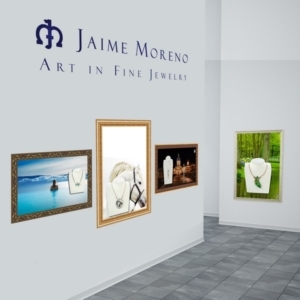 Jaime Moreno – Art in Fine Jewelry, is a brand that is especially recognizable and corresponds to a differentiated product aimed at women with a unique taste and lifestyle, who seek to distinguish themselves and show their individuality, who love the design and know how to value the superior quality.